Urban Participation: through Sense.City you actively participate in to processes and problem solving that directly affect your everyday life in the city. You improve urban development and enhance the relationship between you and the city public services. Co-creativity: The Sense.City platforms provides the tools that activate citizen’s creativity, imagination and communication, engages urban thinking and improves the relationship between citizens, the city municipality and city’s public services. Open Data: An open API for programmers and individuals is offered for anybody interested in building apps on top of Sense.City API. 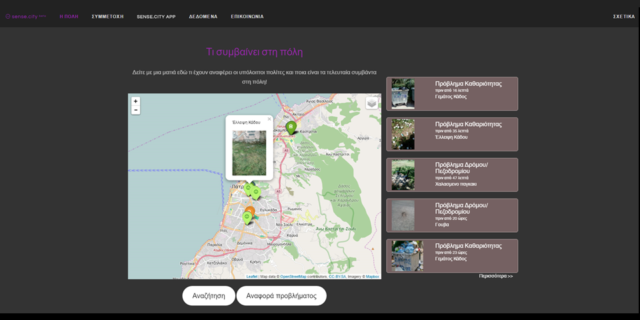 The application is currently used by two greek cities: Patras and Zakynthos. However, the application is still in beta version and still needs improvement.